Thoughts from Brahma Kumaris: When you are always truthful, you'll have nothing to fear. When you are always truthful, you'll have nothing to fear. 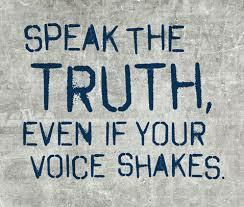 Contemplation: True courage comes when there is the power of truth within you. When you are constantly truthful, you will have nothing to fear. In all the challenges you face everyday you will be able to maintain your courage because of your power of truth. Application: Make sure your actions are based on truth and when things go wrong, you will still be able to maintain your courage. Keep reminding yourself that you have the power of truth with you and you will be victorious, whatever the challenges that come your way. God as a destiny maker is distributing the gifts of a future fortune i.e. a life without any ups and downswhich is only possible when souls and nature are completely pure. That is our original state when we come down on Earth to play our respective roles which was about 5000 years ago as per the secrets of the world drama shared by God with his children at the present moment. This is the moment when He is amongst us and performing His role in the world drama of freeing His children from the chains of sorrow and insecurity due to the world’s problems and the problems in everyone’s personal lives. He will lead us to a world where there is complete security, where every today and tomorrow will be an obstacle-free day, without any sorrow. Such an existence for about 2500 years which will begin very soon when the more than 700 crore souls return back to the world of complete peace i.e. soul world which is beyond the sun, moon and stars from where they have come 5000 years ago. This will happen after all the world souls are purified at the present moment either by the remembrance of God or by clearing up their sins by going through different negative situations due to the instability in the world and in their personal lives. Also, after going back to the soul world, the souls one after the other and very slowly, will return back to a world of happiness, where there is no fluctuation of fortunes. There are just a few moments left in the world clock before the time pointer touches 12 am or midnight and a new morning or the world of happiness begins. We have called this message as – Finding The Destiny Maker because many of us are not making use of this golden opportunity and are not aware that the world clock is about to touch 12 am and the time bell will soon start ringing and souls will start returning to the soul world after an extremely rough duration of few years in the world when things go wrong in a big way, which is the present moment. These rough moments on the world stage are happening now and these negative moments i.e. a lot of difficult circumstances in the lives of the majority of the world population are increasing. So, the countdown for the 12 o’clock bell has already begun.